Eggnog is a divisive beverage. It inspires strong feelings. 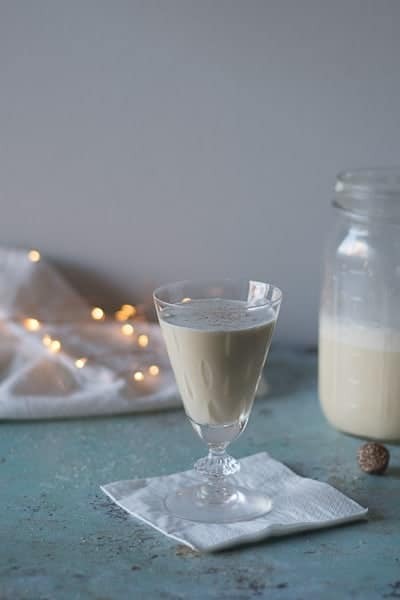 There are some who look forward to the time of year when it’s socially acceptable to down a glass of frothy nutmeg-topped egg and cream, and others who consider it a gloppy scourge of the holiday season. I have always fallen firmly into the former camp. It has been to me an elixir, a tonic for the stresses of shopping and coordinating schedules and traveling and facing so much dark and cold. As a child, I looked forward to when the bottles of the stuff appeared at Quality Dairy, a mid-Michigan staple that is a no-frills dairy, convenience store, gas station kind of place. I would drink it by the mugful. My parents would bribe me with it when I was an adolescent in a bad mood. It was hard for me to stay grumpy when I had some in front of me. Even now, I have a taste for that particular brand of the commercial stuff. But let’s admit that homemade eggnog is an entirely different creature than the thing you find at the grocery store. It’s so much lighter and pleasantly frothy without the syrupy sweetness. And there’s nothing like freshly grated nutmeg. 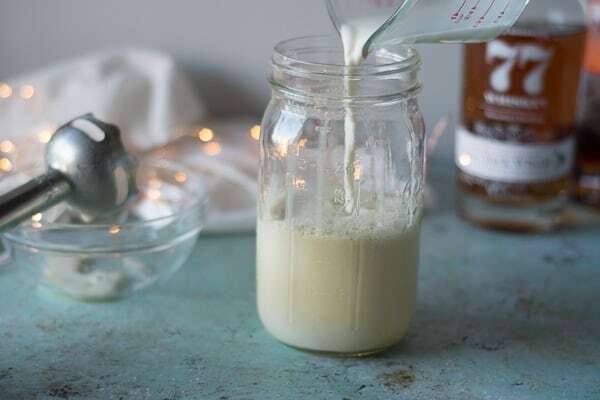 Most of the recipes for homemade eggnog are huge, using a dozen eggs or more and loads of heavy cream, which makes sense when you’re serving it at a party or a large holiday gathering. 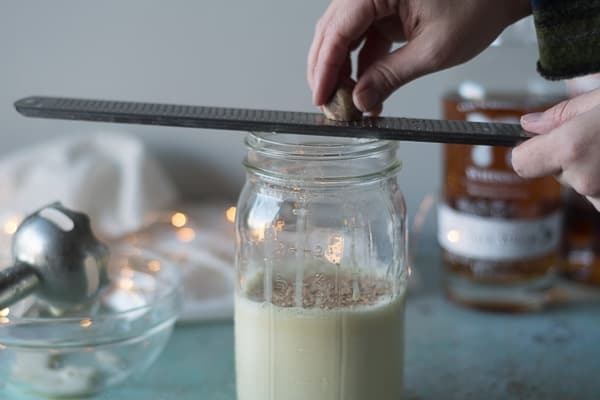 But if you want just a little bit of eggnog, it can be tricky to find one that’s just a few servings, the kind of thing that’s appropriate when it’s just you and your husband and your sister decorating the tree. That’s where Jeffrey Morgenthaler comes to the rescue. 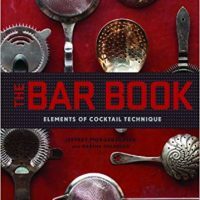 He’s pretty much a cocktail genius, and his book is a must for anyone interested in cocktail technique. His version only uses two eggs and moderate amounts of high-fat dairy, and it’s minimally fussy. It doesn’t require separating eggs or dirtying multiple containers. 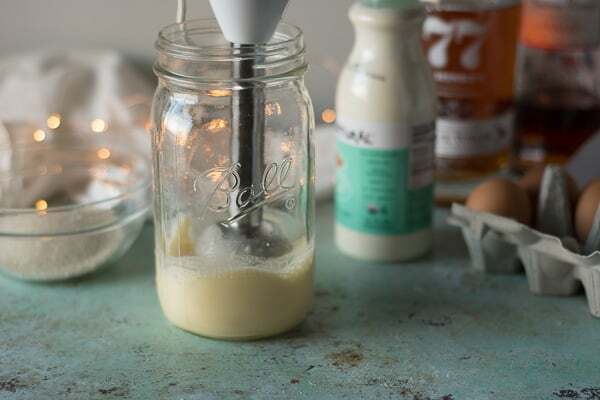 I’ve adapted it slightly to make it even easier using a stick blender where I can make it right in the jar I serve it in, and half and half instead of the combination of milk and heavy cream. Morgenthaler makes this with brandy and spiced rum (in his book he also has a version with tequila and sherry), but I make it with brandy and bourbon because I like it that way. The booze options are very flexible here. 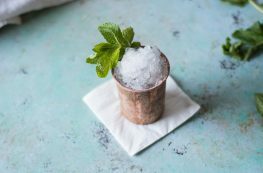 You could even omit it entirely, I suppose, and add a tiny splash of vanilla extract if you’re serving it to children or teetotalers. It just takes a few minutes to make. And for those of us in the pro-eggnog camp, it’s a heavenly little drink of holiday cheer. Looking for other holiday drinks? 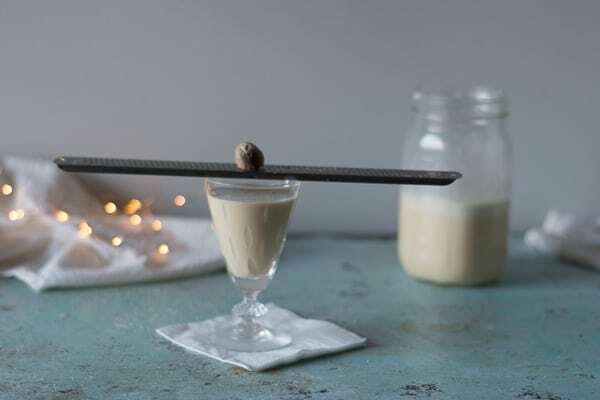 This clarified milk punch is crystal clear and silky smooth. 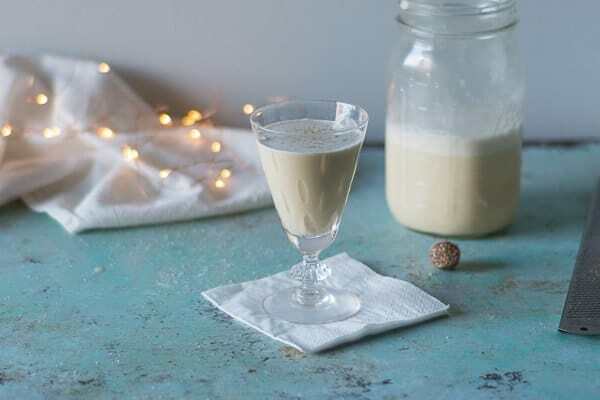 This eggnog recipe is perfect for when you want just a few servings. Morgenthaler says it serves two, but I’d say it easily serves four. It can easily be scaled up if you want to make it for a slightly larger crowd. I like to make this using a stick blender so I can blend it in the same jar I store it in for easier cleanup, but you can use a regular blender here too. I use brandy and bourbon here, but you could use any combination of brandy, bourbon or rum. This recipe uses raw eggs, which means there’s a small risk of salmonella. I’m comfortable with that risk, but I wouldn’t serve even a booze-free version to pregnant women or people with compromised immune systems, just to be safe. 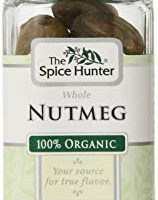 Do use freshly grated nutmeg here. It makes such a difference. 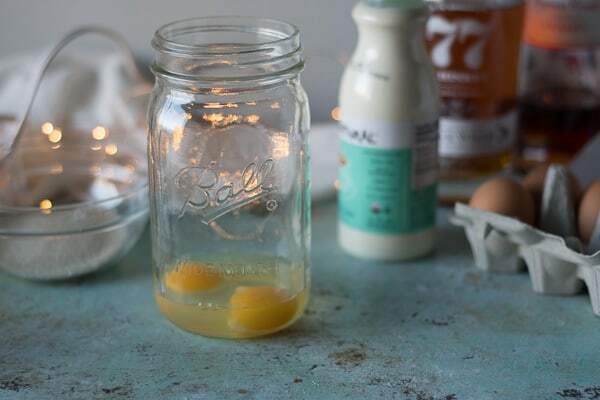 In a quart-sized mason jar, add the eggs and blend with an immersion blender for one minute. Add the sugar and blend for another minute. Add the half and half, nutmeg, brandy, and bourbon and blend until combined. Chill thoroughly to allow flavors to meld. Top each glass with freshly grated nutmeg before serving. Yum! I never knew how this was made! Thanks for the recipe! Love this! I don’t like the store-bought stuff either– this is way better!!! Homemade definitely makes a difference on this one! I love small batch recipes! I love that you don’t have to waste it! It’s a divisive beverage, but those of us who love it really love it! 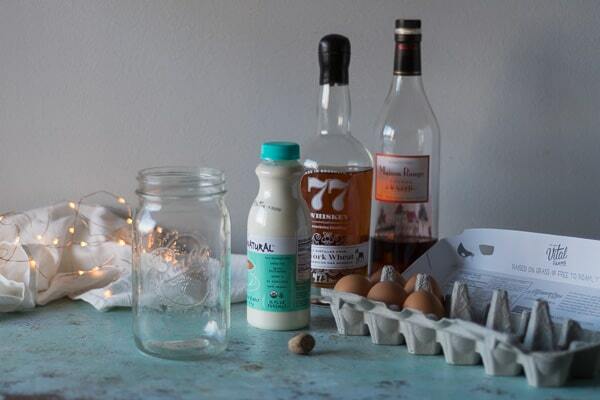 I’ve never made my own eggnog before — because my aunt spoiled me with her version. This looks fantastic, though — might have to try! Lucky to have an aunt like that! This one seriously takes like 2 minutes to make. So simple! Great idea to make this in small batches! I’d love one that fresh! YUM! Agreed! Freshly made eggnog is delightful! Should I pick up the ingredients? The other eggnog is here. Love and Yum. Can I make this with spiced rum? Thank you for the recipe! Sure! Just sub it in for the other alcohol.